As a child, Kaur heard Harbhajan Singh Yogi when her parents attended his classes after becoming Sikhs. The family moved to California when Kaur was two, living in Long Beach and Sacramento. When Kaur was six, the family went to India where her mother studied kirtan. Kaur lived on a ranch near Bolinas, California as an adolescent, playing kirtan with her mother in Sikh temples and attending Tamalpais High School in Mill Valley. While at Tam High, she played violin in the school orchestra and began songwriting. Bob Weir of the Grateful Dead coached her and her classmates before they performed her song Saving the Earth at an Earth Day concert in San Francisco. Kaur was also active in social and environmental causes while in high school, serving as president of the Social Action Club, which started a campus recycling program and organized environmenal awareness programs. The Club also led the effort to change the school mascot and sports team names from the Indians to the Red Tailed Hawk in 1990 and 1991. After graduating from Tam, Kaur attended Mills College in Oakland, California, receiving a bachelors degree in biochemistry. She then returned to India, to study kirtan under her mother's teacher, Bhai Hari Singh. She lived near the Golden Temple. In 1997, Kaur began a career as a food technologist with Peace Cereals in Eugene, Oregon. 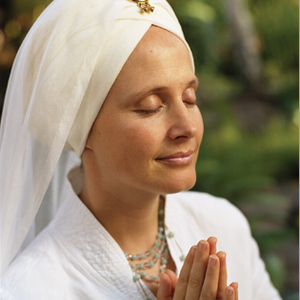 A Sikh and Kundalini Yoga teacher, Snatam Kaur is a singer and musician, gaining a growing fame in the world of spiritual music. After a few years as the singer of the spiritual music group The Peace Family, she started a solo career. Her music mixes western melodies with Indian sounds, mantras from the Kundalini yoga tradition, words of Harbhajan Singh Yogi and personal lyrics. She often tours in the United States and Canada, and within Sikh communities worldwide (India, Singapore) among which she is more and more renowned as a talented kirtan singer. Spiritual music artists such as Deva Premal now sing her compositions.